The rapid decline in population that saw the cities of ​​Buffalo and Niagara Falls, New York shrink to a percentage of their original size isn't much different than the problems that are impacting Detroit right now. As people moved out of the city to either the suburbs or to other cities in search of new opportunities, much of the urban core was left neglected and abandoned. Areas that were once thriving, struggled to get by and many residents left town. In their wake, homes, businesses, factories and churches sat, waiting to be used again. Unfortunately, many of these buildings have disappeared thanks to the wrecking ball and the hope in the 1960s that vacant land was more appealing to developers. They didn't come. As the stock of historic buildings shrunk the history and stories that they carried with them were lost to time. Those that remain have become popular destinations for urban explorers to photograph and investigate. 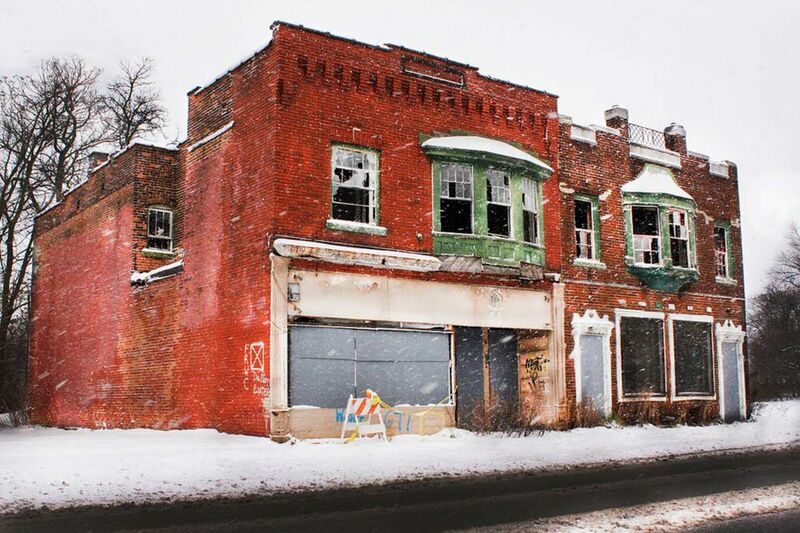 Those who seek out the forgotten pieces of history will find plenty in Western New York and although the city is seeing a large resurgence in interest and investment, there are still plenty of examples of urban decay left to explore. Hovering above the rooftops of the city's eastside neighborhood filled with 'worker cottages' the Wonderbread Factory has become a neighborhood icon. The 180,000 square-foot behemoth sits amongst a number of other factories all in varying states of disrepair, some used as storage facilities, some not used at all. The factory has become a particular favorite among urban explorers mainly due to its iconic signage. Although a number of the letters are missing it's the perfect example of an iconic structure, once employing hundreds of workers, now left to decay. The inside is still filled with dust-covered desks and a number of large machines, almost as if people got up from their jobs one day and never returned. The building is particularly popular with urban explorers for its sheer size and general accessibility. Tours are regularly hosted throughout the terminal and a number of events are hosted throughout the year to raise funds to keep the building in generally good health until someone with a vision can bring it back to life. Thankfully, over the past decade, there has been a renewed interest in the structure with a number of proposals floated to bring the building and surrounding terminals back to their former glory. The building has been considered for apartments, office space, and even to be used as a train station again, but nothing has come to fruition yet. Straight from a horror film, this castle-like building has towered over the city for over 150 years. Built in tandem between famed architects Henry Hobson Richardson and Frederick Law Olmsted--the man who designed New York City's Central Park, the building was considered at the forefront of medical technology when it opened to house mentally ill patients. Operating until the 1970s, the building was left abandoned in favor of a newer facility that was built on the property. This building is a favorite amongst urban explorers due to the detail that still remains and the medical devices left behind. Walking through the corridors is like being on the film set of a horror movie. Until recently the fate of this building was up in the air with no real plan for redevelopment. Thankfully a couple of years ago a team assembled to tackle this project and not only bring the building back to a healthy condition but to make it one of the shining stars in the city. Right now, the building is in the midst of renovation but many sections of the building still wait for their day in the spotlight. The site offers tours and events from May until September each year. This tiny structure stands on an unimpressive side street out of the hustle of Niagara Falls, Ontario, away from the tourists hoping to snap photos of the falls. Boarded up and isolated with very few surrounding buildings, this structure offers little to suggest that it holds an impressive story. Used for many different purposes over the last decade, with the last as the neighborhoods police station, this structure once played a part in the movie "Niagara" starring Marilyn Monroe. Now, the structure is far from the Hollywood backdrop it once played after sitting empty and abandoned for nearly 40 years. You'll see a trend amongst these buildings with many in Buffalo's eastside neighborhood. This section of the city was hit particularly hard during the 1950s and 1960s when the population began its initial decline. As people moved away, they left behind stunning structures like ​St. Ann's. The parish worshipped out of the cathedral until as recently as 2011 until the diocese closed them down. While some have called for the beautiful structure to be torn down, many are hailing the property for its beauty and hoping that it can be used again soon. While stunningly beautiful the purpose of The Toronto Power Station was relatively gritty as a generating station. You might expect well-dressed executives making their way in and out of the building across the massive front steps to the front door, but that was never the purpose of this structure. Built in 1906, the station ceased operation in 1974 as it was determined that the water farther downstream could be used to generate more power. It's hard to believe that after 40-plus years that the structure looks as good as it does, but that may not last long. With the severe weather conditions around the Falls, there's no guarantee that this building will last much longer. In the meantime, explorers have documented this structure thoroughly as it holds significant ​importance to Niagara Fall's story. For their implicit simplicity, the grain silos that line the Outer Harbor of Buffalo are one of, if not the single most important structures in the city. These behemoths are the reason for why the city became what it became. Thanks to the silos and the industry that led to their construction, Buffalo became a pivotal stop on the Erie Canal and grew to become what it is today. Unfortunately, many of the silos sit empty and abandoned today. They've become incredibly popular with urban explorers as they investigate the history of the city as it sits neglected. While I would caution anyone interested in checking out these structures to be vigilant, they are truly a sight to be seen and they may not all be abandoned for long. Only a couple of years ago one of the silos was converted to an event space that has exploded in popularity. As people realize the incredible potential that these buildings hold, they won't remain forgotten for long.